Ground-penetrating radar (GPR) uses very high-frequency (VHF) radar reflections of underground features to generate baseline maps and then matches current GPR reflections to those maps to determine a vehicle’s location and position with centimeter level accuracy. For subsurface sensing, GPR is one of the most versatile and prolific sensing modalities today. Radar: GPR systems work by sending a pulse of electromagnetic radiation into the ground and measuring reflections that originate from scattering points below the surface. Reflections occur at the interface between objects that have different electromagnetic properties, such as pipes, roots, and rocks in the surrounding “dirt.” However, it is not these discrete objects but rather the natural inhomogeneity in subterranean geology that often dominates GPR reflection profiles. Soil layers and variations in moisture content cause reflections in the data. Thus, GPR paints a complete picture of the subsurface environment. With few exceptions, nearly every discrete object and soil feature is captured, provided that it is not significantly smaller than a wavelength and that it has sufficient contrast with the surrounding soil. The premise of GPR localization is that these subsurface features are sufficiently unique and static to permit their use as identifiers of the precise location at which their reflections were collected. Mapping: The first step in the GPR process is to develop a map of the environment below the road. In this first step, the GPR data of subterranean “objects” are simply collected along with GPS tags to form the initial database of subsurface features. This subsurface map is then used as a reference data-set in order to estimate vehicle location on subsequent visits. Tracking: Next, online localization is performed in several steps. When the vehicle is in motion, data are periodically fetched from the database for matching. A local grid of baseline data is always maintained. A search region surrounding the initial location estimate contains “particles” (points on the grid) representing candidate locations and orientations. An algorithm iteratively evaluates the particles to narrow the search for the maximum correlation within the vehicle’s five-dimensional space (easting, northing, height, roll, and heading). 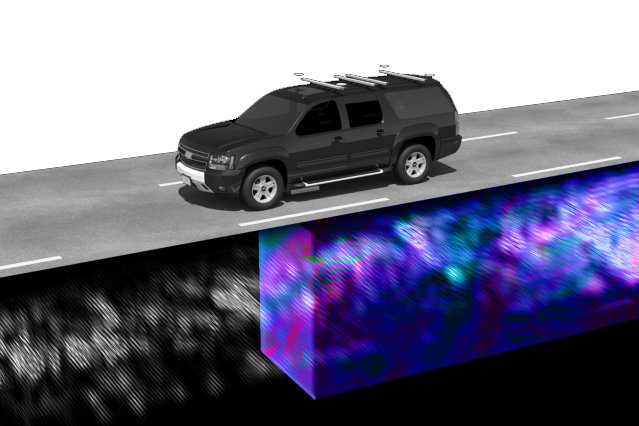 After several iterations, the highest-correlation particle is chosen as the most likely estimate of the vehicle’s current location and orientation. The search region is updated and either expanded or shrunk to reflect this new estimate. "Localizing Ground Penetrating RADAR: A Step Toward Robust Autonomous Ground Vehicle Localization"